In synagogues around the world, during the time of year when Yom Kippur, the 10th day of the 7th Jewish month approaches, people are seeking to make restitution, and get forgiveness of sins. This is often a general "forgive me for anything I have done wrong." and then a person doing everything in one's power to make things right, a catch all "forgive me for anything I don't know I did wrong." (makes one mindful of the "unknown god" idol of acts 17). It is a desire to "Call upon the LORD while He is near", and Yom Kippur is the culmination of the days of awe leading up to this holy time. It is the Day of Atonement (this is plural in Hebrew-atonements), and speaks of "coverings" as found in Leviticus 16. It came on the heels of the death of Aaron's sons, whose crimes in the Holy Place brought their punishment, and the atonement came into view with that backdrop. It told the when and how a priest could enter into the Holy of Holies - how a somewhat distant God was to be approached. 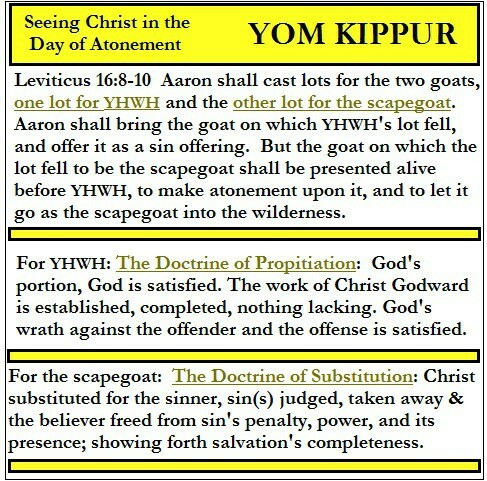 Thus one day a year, the Day of Atonement ritual came into view that involved two identical goats, one for the scapegoat (let loose) and the other killed for the LORD (Jehovah-Yahweh). The ritual pictures the forgiveness of sins and the cleansing of the sanctuary. A key word in Leviticus is "covering" (the meaning of atonement). Lev. 16:29-33 says: And this shall be a statute for ever unto you: that in the seventh month, on the tenth day of the month, ye shall afflict your souls, and do no work at all, whether it be one of your own country, or a stranger that sojourneth among you: For on that day shall the priest make an atonement for you, to cleanse you, that ye may be clean from all your sins before the Lord. It shall be a sabbath of rest unto you, and ye shall afflict your souls, by a statute for ever. And the priest, whom he shall anoint, and whom he shall consecrate to minister in the priest's office in his father's stead, shall make the atonement, and shall put on the linen clothes, even the holy garments: And he shall make an atonement for the holy sanctuary, and he shall make an atonement for the tabernacle of the congregation, and for the altar, and he shall make an atonement for the priests, and for all the people of the congregation. The question naturally would arise today "how can they have atonement without a priesthood, altar, and sacrifice?" Modern Judaism has answered this problem with an emphasis upon the things that the "people" can do (self affliction) instead of what is missing. This is often done by personal fasting with an emphasis added to ensure there is present a personal humility and affliction that can be "seen" by God (and perhaps by others). The importance of God "seeing" this sincerity is seen and explained by the use of the same word in Exodus 3:7 "And the Lord said, I have surely seen the affliction of my people which are in Egypt, and have heard their cry by reason of their taskmasters; for I know their sorrows." The dominant view in modern Judaism is that sin is now atoned for by means of these prayers, repentance, and good deeds. Substitutionary atonement is not seen as needed because people are not viewed as having a sin nature from birth. Instead they believe that each life begins with a pure soul -as said in each morning prayer: “Oh my God, the soul which You gave me is pure”- , and they struggle all their lives to keep it that way. Yet the low place sought in their "repentance" can and does at least bring a cry out to the Lord, men having reached a place where they realize their state and that their own strength cannot fully deliver them, nor their efforts, no matter how sincere. It forces a look up to heaven, to call out to Yahweh, that help is needed. Modern Judaism often practices a "fast" as part of the "lowness" but is in reality incomplete because the individual is left in a place of seeking atonement without the goats, without the priesthood, and dependent upon what "he himself" can do. The appeal is to the heart, that "with all one's heart" one should with sincerity seek to be "right". that modern atonement is based upon the efforts of the individual to bring himself low. that modern atonement has no priest, nor sacrifice nor blood. The problem is that the work of Messiah is absent. The efforts of man, albeit they include efforts that acknowledge personal shortcomings & sins...but at the bottom atonement is missing. The Law of Moses required the goats, the priesthood, the altar, but today the adherent only has his own efforts a lowness, and a vague hope of receiving atonement. Of interest, but outside the scope of this blog entry, is that many religions (Catholicism, Islam, Judaism, Christendom) seek forgiveness this way. ie...by asking, and confessing. But without the shed blood and penal substitution seen in the death of a victim, the receipt of forgiveness does not occur because satisfaction (for Yahweh) isn't embraced. The desire for the scapegoat is present, but the price isn't paid. Paul exposes the problem in Romans 10:2-4 "For I bear them record that they have a zeal of God, but not according to knowledge. For they being ignorant of God's righteousness, and going about to establish their own righteousness, have not submitted themselves unto the righteousness of God. For Christ is the end of the law for righteousness to every one that believeth." The goat that was "for Yahweh". This goat that was killed on Yom Kippur was done so "for the LORD." Its blood was for a sin offering (Lev. 16:9). This blood was brought inside the veil and sprinkled on the mercy seat. Here we see the truth of propitiation manifested. The basis of forgiveness, where God can and does act righteously towards sinners, in dealing with their sin, and forgiving them, is seen. Blood must be shed, and God is satisifed, and on that basis He shows mercy. In contrast, the shadow of Yom Kippur was repeatedly yearly, a reminder of sins still present. In the cross of Jesus Christ is the substance. There was a Once for ALL completed satisfaction made. He fulfilled the types of all offerings and holy days, including the Day of Atonement. His work was finished so as never to be repeated. FOR YAHWEH. In contrast, the efforts of the people to merely "bring themselves low" and afflict their souls, was insufficient. In reality stopping at this point is merely to "seek to establish their own righteousness" which is an abomination in the eyes of God. It is not incorrect to seek what the scapegoat pictures (taking sin far away), but without sprinkled blood on the altar it ultimately denies the person and work of His Son, the Messiah. We marvel at just how far the types and pictures of Leviticus take us, to the very threshold of viewing the Messiah in His work of redemption accomplished at the cross and the empty tomb. We marvel as well that even with this tremendous opportunity to "see" Him in advance, that so many under the auspices of Judaism fail to see that Jesus Christ is indeed the fulfillment of Yom Kippur. Should a reader of Jewish background be found reading these lines, we implore in love,.... can you not see Messiah prefigured in Yom Kippur, can you, will you, embrace the Messiah who came and died in your stead, and is risen from the dead. He is God's Son, the Lord Jesus Christ. He is the priest and He was the sacrifice, and He is alive.